"You've got my total attention." 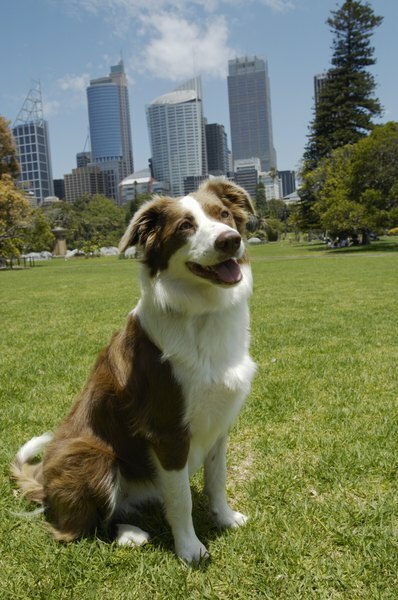 Border collies aim to please their owners by responding crisply to commands. Even at the puppy stage during housetraining, kindness and praise readily motivate your handsome young border. Bring Roy or Nell home during the summer or on a weekend when you have plenty of time to devote to his or her house training. Take your adult dog outside the first thing every morning and the last thing each night. For a small pup, more trips will be needed since they can't hold their bladder for long. Set a kitchen timer or an alarm to sound every two hours after the first morning walk. Take your pup out and walk him for at least five minutes each session. Play while you are outside to run off some of that famed border collie energy. If he goes while outside, offer praise and a dog treat. This teaches him that going potty outside is a good thing. Develop a phrase, such as “go potty” or “time to go” that you and your border collie relate with going to the bathroom. Put the word “good” in front of the “go potty” phrase after Nell does her business. Watch at other times for signs that Roy may need to go potty, such as sniffing the floor, whining or walking towards the door. If he has an accident inside, say “no” in a stern voice. Take him outside and use your phrase for going potty. You can also crate-train your border collie to avoid accidents at times when you can’t directly supervise her. Can Border Terriers Be Raised With Cats?